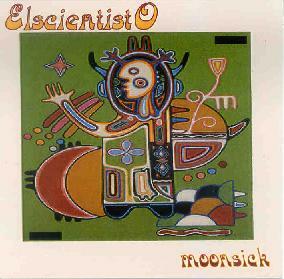 Elscientisto is the solo project of Massachusetts space rocker Shawn Michael Ross. Seeking to create psychedelic rock with a spacey, improvisational bent, Ross has produced the Moonsick EP. Space Rake, kicks things off with a quirky jam, the guitar notes falling in descending showers while synths creak eerily beneath them, but at about the 2 ½-minute mark, it explodes into a blistering space jam built around a catchy, almost funky riff, with the eerie synths still moaning underneath. Trapezium, on the other hand, is a lazy, languid, late night excursion, with weeping psychedelic guitar and gurgling, fuzzing, seductively moaning electronics. Miles rounds off the EP’s 23-minutes of music with an oozing cross between murky, industrial glitchcore and funky psychedelic guitar explorations. I thought Space Rake was the best of these tracks. Ross shows on that track he has a definite feel for energetic space rock, and the hook that drives the piece is a real winner. The latter two tracks are a little darker and more adventurous, and display Ross’s talents as a creative ambient explorer as well. For more information you can visit the Elscientisto web site at: http://elscientisto.com. Contact via snail mail c/o Shawn Michael Ross; 71 Hale St; Beverly, MA 01915.